Hello everyone! Welcome to Day 4 of my 12 Days of Christmas. Sorry for not posting this yesterday but life completely got in the way. I didn't even have a moment to sit down to type out a blog! Well, on to today's card. Today I used the stamp set Feathers & Frost. 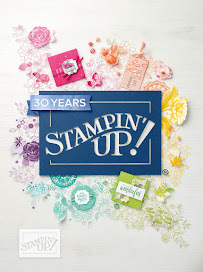 Here is a tip when using the Stampin' Blends.....you can use ANY of the colored Stampin' Up! inks with the Blends and they would cause the ink to bleed. That is because all the colored inks are water-based and the Blends are alcohol based so they have no affect to each other. This makes it perfect if you don't want to use the Memento Tuxedo Black ink pad for you stamped image like I did in my card today. 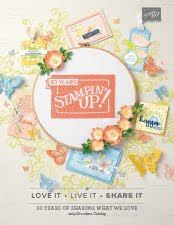 I used the Stamparatus tool to stamp my greeting as the stamp is all one line in the stamp set and I wanted it to fit in the Stitched Shape die I had chosen. I simple stamped half of the stamp then stamped the other one underneath it. The best part of the Stamparatus is you can re-stamp exactly where you need it. I then cut a piece of the Mini Gold Sequin trim and put it under the sentiment. 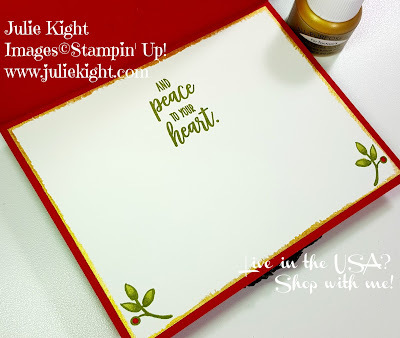 I wanted to carry some of the gold look into the inside of my card so I used a paint brush and the Vegas Gold Shimmer paint and lightly tapped the edges of the cardstock. I also stamped in the bottom corners and colored them in too. Thanks so much for checking my blog out today. If you want to be notified of when I post new projects or want to get my exclusive newsletter then subscribe to my mailing list. 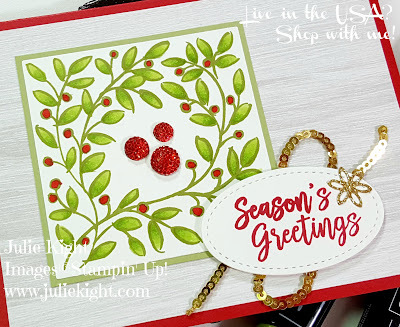 Here is what I used to make this card, click on any item to go to my shopping page to purchase it!